US PRESIDENT BARACK Obama yesterday called on congressional Democrats to “fight” to preserve his signature healthcare reform, with its future in doubt as Donald Trump’s incoming administration vowed a swift repeal of the controversial law. Obamacare, the fruit of an eight-year drive to extend medical coverage to tens of millions of Americans, will come under sustained assault when Trump takes office on 20 January with Republican majorities in both chambers of Congress. But the debate over US health care began in earnest yesterday at the highest levels, with Obama and Vice President-elect Mike Pence making duelling visits to Capitol Hill to urge their legislative foot soldiers to gird for battle. 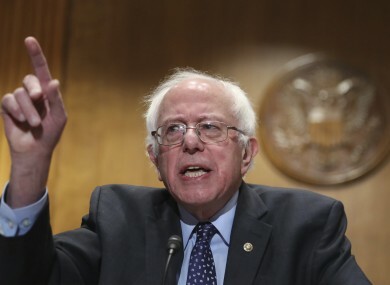 Former Democratic presidential hopeful Senator Bernie Sanders tweeted strong criticism of Republican lawmakers yesterday, challenging that they had no plan to replace Obamacare if it was repealed. You don’t throw 30 millions people off health care without having a plan to provide health care to those people. Meanwhile, Obama met with Senators and House Democrats and urged them to fight against any repeal. “I envy you for the opportunity you are going to have to engage in this fight to protect health care for the American people,” the outgoing president told Senate and House Democrats, according to Senator Ed Markey, who attended the 100-minute meeting. After a crushing election loss, Democrats may have limited options for stalling a repeal of Obamacare without significant Republican defections. They also face criticism that Obama’s reforms have led to rising insurance premiums and a string of technical problems. But certain elements of Obamacare remain popular, notably the provisions barring companies from refusing coverage due to pre-existing conditions and allowing children to retain coverage on family plans through age 26. Republican opposition in general to Obamacare is clear – “They broke the health care system”, House Speaker Paul Ryan said of Obama’s administration – but his party’s prescription to fix it is not. Ryan has proposed a tax credit system as a possible replacement, but the costs to government and individuals remain vague. The White House is betting that American voters will revolt if Trump moves to strip millions of their coverage with no viable alternative – forcing the incoming president to confront the most radical reformers within his own party. While Pence addressed the issue gingerly in Congress, he stressed that Trump would make the process of repealing the Affordable Care Act one of the administration’s top priorities. “The first order of business is to repeal and replace Obamacare,” Pence told reporters in the US Capitol shortly after meeting with House Republicans. But Trump himself cautioned against over-hasty action. “Republicans must be careful in that the Dems own the failed ObamaCare disaster,” the president-elect said on Twitter, warning Republicans to allow it to “fall of its own weight”. While urging a full repeal of the law, Ryan also said Republicans should avoid putting millions of families in further financial jeopardy by gutting Obamacare without a viable alternative in place. “We’ve got to fix this by replacing it with something better. In that transition, we want to make sure we don’t pull the rug out from anybody,” he said. One Republican lawmaker, Chris Collins, said the party was looking at a six-month timeline for crafting an Obamacare alternative. Other Republicans said that was far too ambitious. Senator John McCain expressed confidence that fellow Republicans would be able to forge a replacement plan to go along with legislative repeal action. “We’ll be doing both,” McCain said. We’ll know what the replacement is. Senate Majority Leader Mitch McConnell, who has already launched the legislative process for repeal, welcomed Pence to lunch with all Senate Republicans after his House huddle. Pence, addressing reporters afterward, provided no details on the replacement plan being crafted by his party. But “the architecture of the replacement of Obamacare will come together, as it should, through the legislative process in the weeks and months ahead,” he said. Email “'You don’t throw 30 million people off healthcare without having a plan' - Battle lines drawn over Obamacare”. Feedback on “'You don’t throw 30 million people off healthcare without having a plan' - Battle lines drawn over Obamacare”.